I’m sorry, this contest is now closed, a winner has been selected and has been contacted (if you entered, I suggest you check your email). Don’t fret! 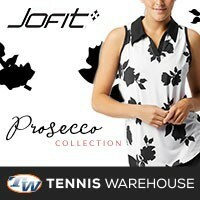 There will be another contest for the 2013 Australian Open! The winnings! A 2012 Babolat Pure Drive Roddick with L-Tec strings! Oh my, it’s that time of year again! The 2012 US Open is right around the corner, I can hardly contain myself. It feels like the 2012 Wimbledon Championships just ended; well, they did just end a couple of weeks ago. 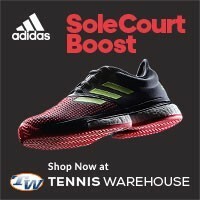 If you remember, I did a Babolat Propulse 3 Stars & Stripes shoe giveaway; the winner was selected and has already received his winnings (picture in link). Since that tennis giveaway was so successful, I thought I would continue the Babolat trend and put a Babolat Pure Drive Roddick as the 2012 US Open giveaway prize! Heck ya! A Babolat Pure Drive Roddick giveaway tennis racquet, how about that? Check out the details of the Babolat Pure Drive Roddick tennis racquet. But wait…that’s not all! To sweeten the giveaway, I will personally install L-Tec tennis strings using the JET method (I am an authorized L-Tec/JET stringer, learn more about the JET method). 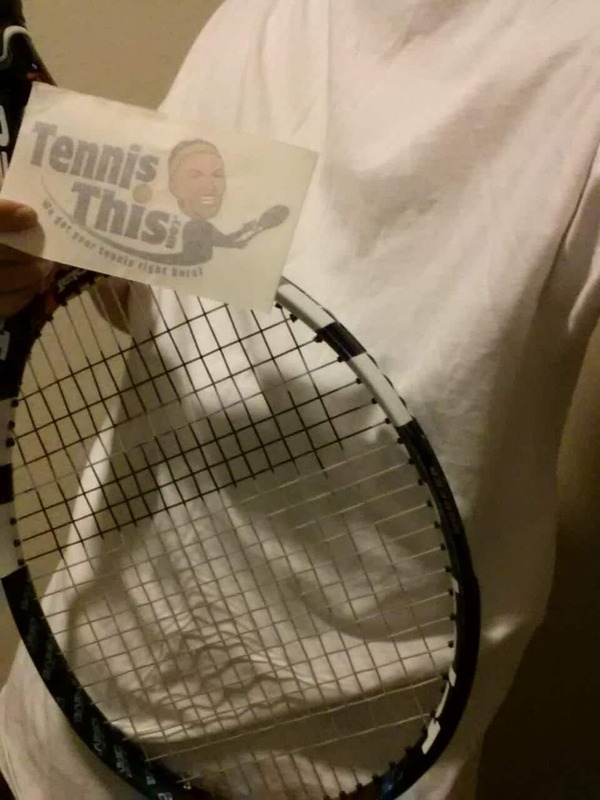 Oh yeah, and you also get a cool Tennisthis.com sticker, ya know, to put on your car, laptop, window, or wherever. When the winner of the Babolat Pure Drive Roddick giveaway is selected, I will be in touch about the JET method and select the best L-Tec strings for your game. 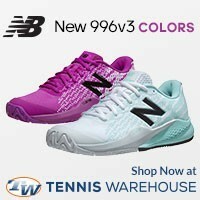 The Babolat Pure Drive Roddick giveaway will run from 7/17/2012 through 9/9/2012 (or the 10th, depending on the when the men’s final is played). Anybody can enter this giveaway, only one winner will be selected. If an international winner is selected, he or she will be responsible for all shipping costs, there is no negotiation on that. When the winner is selected, I will send that person an email (please use a valid email address); that person will have 24 hours to respond, if no response is received, another winner will be selected. Winner must also agree to take a photograph of themselves (face or not) with their winnings. To enter, leave your best memory of any US Open match; be it a doubles match, singles, men, women, boys, girls, mixed doubles, whatever in the COMMENTS SECTION BELOW! As long as it has a special place in your heart. Also, don’t forget to share this on your favorite social media outlet, Facebook, Twitter, Pintrest, etc. Good luck to you all! 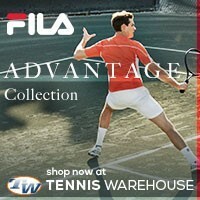 Babolat does not endorse this Babolat Pure Drive Roddick giveaway. If you would like to have your tennis racquet strung with the JET method and L-Tec strings, send me an message. When I was watching Novak’s tennis matches, I was impressed by his serves and gameplay. This motivated me to do better and strive higher. The 2012 Djokovic v. Murray Australian open Semifinal. That was an inspirational match. Very intense and close, between my two favorite players. I’ll go with 2010 Federer/Novak semifinal. They were both amazing. When Jack Sock and Melanie Oudin won the Mixed doubles event in 2011. A good way to make a name on the tennis tour as an up and coming star even though he is ranked, I feel, 100-130 places too low. thirty-ninth (39th) birthday where the crowd sang “Happy Birthday” to Jimmy. Also the famous quote that Jimmy said: “This is what they want”, This match definitely showed the warrior he really was. 2011, when Djokovic beat Nadal in 4 sets. I still remember the exasperated look on Rafa’s face when nothing he did was shifting the momentum to his favor despite Novak’s seemingly exhausted state through the latter half of the match. It was Agassi and Sampras and I was about 3 at the time my dad had changed the channel and I was amazed and my dad explained to me when I was older what had exactly happened and that’s why he had me start playing tennis and now I have been committed to it. His serve and volley style was exciting to me and the standing ovation they good was well deserved. They both played very well! For whatever reason in 1982, I had been “grounded” It must have been something really bad, because Dad wouldn’t even let me leave the house to play tennis. In the days of no cable TV, I was forced to watch the Jerry Lewis Telethon (torture at that age) or The Open. I watched McEnroe, my personal favorite at the time, get upset by Van Patten. The tournament went on to feature Connors winning his 2nd to last Grand Slam over Ivan Lendl, he won 5 in his career. I think I saw the light of day a week or so later after my grounding was lifted. It was an epic match between Roddick and Isner in the 4th round in 2009.I can’t forget that tragedy, and even today i’m sad because after that Wimbledon final against Federer i was really hoping for him to win the US Open. Ok this is taking it back, but do you remember an 18 year old Agassi beating Conners, then 36, at the 1988 Open Quarter finals? Melanie Oudin making her run in the 2009 Open making it to the quarters. She had my whole family watching every night. She had my 9 year old twin daughters asking when does Melanie play again? It really peaked their interest in the game. Aggasi’s last win at the open I’ll never forget! Many hours and puking from the players lol. Agassi-Blake in Quarterfinals of Us Open 2005. Blake was so near of victory, but the victory escaped from his hands. Fifth set tiebreak was amazing, with the spectators fully into it. Fed coming so close in last year’s semi’s. That was some great end of match drama. My tennis memory is when I saw Jack Sock and Melanie Oudin fight their way through in Mixed Doubles last year. It was such a huge surprise, who would have thought the young guns would win a grand slam? Amazing. I had the pleasure of watching Agassi’s final win at the US Open. It was a late evening match against Baghdatis that went well past midnight. Andre pulled out an epic 5 setter while Marcos feel to the court with severe cramps in his legs. That night, I proposed to my (now) wife! Novak saving two match points in 2011 us open vs. federer. It has to be about federer at the open. The magic and the genius shot making that he brings over and over again. I am still feel awe that he did tweeners at the open. 2010 Novak Vs Roger Semifinal.OMG what incredible rallies.. over the top tennis… ridiculous how good these 2﻿ are. 1991, Connors vs Krickstein Connors winning with pure desire. 2005 US Open. Federer vs Agassi…. Always rooting for the old underdog. 2008 US Open final against Andy Murray in straight sets. 2003 us open semi final between roddick and nalbandian . I was playing my freshmen year in college first match of the season in a team tournament. We traveled to Montreal. The match was on, I had to go play. Roddick was losing. I came back he won the third set tie break saved match points, and dug deep to win. From that moment I was inspired, and battled hard in my next match for a three set win. Roddick has been my favorite player, and has taught me to fight like a champion and never give up. I have to say that my fondest memory was 2007, Roger Federer’s “Darth Federer” outfit for his night sessions. It was especially exciting at night with all the energy the crowd put out. It was electric. That was a lot of fun to watch Fed and Nole duke it out in the final. Looking forward to winning this giveaway! Hahaha!